Welcome to part one of a two part series. These two articles are going to explain exactly how Magic Online’s trading system is foundationally flawed because it ignores the very economic nature of Magic cards. 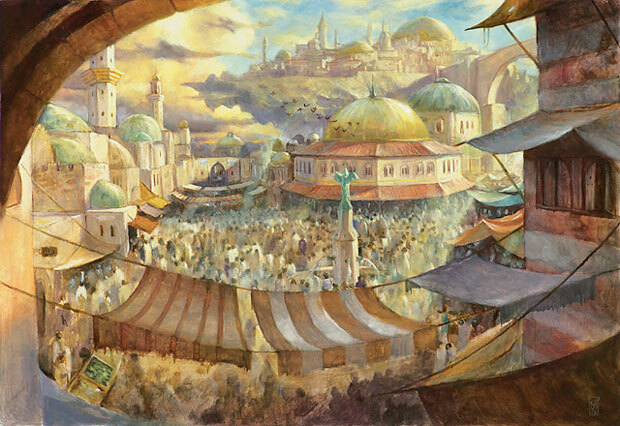 The progress will be as follows: In the first article, we will learn what a commodity is in terms of the marketplace and then we will see how Magic cards behave as commodities. In part two we will see how MTGO fails to treat Magic cards as such, and finally examine a possible solution. We hope that a breakdown of the issue and a presentation of a potential solution will encourage Wizards to make similar changes in future versions of Magic Online. When your car needs gas, how do you decide where to fill it up? Do you have a specific gas station you go out of your way to visit because their gas smells like flowers, or because it’s organic, or it fits into your gluten-free lifestyle? Or instead do you just pull up to the nearest pump that takes credit cards whenever the light on your dashboard turns on? If you’re like most Americans, you have little or no allegiance to a particular location or brand of gas station. The right gas for you is whichever happens to be closest. Why is it that you don’t bother to make a point to use one particular location, especially when we live in such a brand-oriented culture? It’s because when you pull the handle on that eighty-eight octane pump you know that the dead dinosaur gushing into your car’s hungry coffer is the same there as it would be from any other of the eighty-eight octane pumps in America. Have you ever shopped for art? Unless you know the specific piece you want it can be time consuming, intimidating, and expensive. Let’s say you decide that a wall in your apartment is looking rather bare. You’re not sure what you want, just that you’d like to hang a piece of art there. If you live in a metropolitan area and/or you’re wealthy you may hit up the local galleries to see what’s available for purchase locally. Most internet denizens such as you and I won’t have the funds to purchase originals like that though, so we hit up Google and plug in “art.” Lo and behold we find ourselves at art.com. “Alright,” you think, “time to buy me a sweet piece of wall candy.” As you begin scanning the page you realize this could be a big project. The splash page is separated into categories – landscape, abstract, vintage, photographs, etc. You’re not even sure what type of art you want. An abstract series of cubes and circles? A photograph of a stunning waterfall? An artist’s rendition of the Grand Canyon? A replica of a famous painting? A horse? Mapplethorpe? Regardless of what you’re searching for, one thing is for sure: you’re going to be browsing a lot of photos before you find something you’re happy with. There’s no way to get around it; you simply have to view hundreds or thousands (or if you’re me, tens of thousands) of images before you can be content with your decision. This consumer-oriented perspective on the dichotomy of gasoline and artwork illustrates just how different purchases on opposite ends of the commodity spectrum behave. On the one hand a good like gasoline is, for all intents and purposes, identical from one vendor to the next. The gas you pump into your car at the Sonoco in Maine is basically the same as the gas you get from the BP down in Louisiana as it is the same as the gas at the…whatever gas station chains exist in California. On the flip side of that, artwork is wildly different in character from one piece to the next. If I take your 2’x2’ photograph worth roughly $300 and replace it with a different 2’x2’ photograph worth roughly $300, you would be really annoyed. They may have similar physical dimensions and market demand, but it’s the content of the image that you care about. Let’s step back a little bit for a better view of the bigger picture. Common parlance is that a commodity is a good or service which is interchangeable with another good or service of the same sort. (In other words, a commodity has a high level of fungibility.) An ounce of copper is basically the same as any other ounce of copper, as far as the market is concerned. As long as that ounce of copper falls within a certain set of specifications, it doesn’t really matter who I get it from. I am only interested in the price, because the copper itself will not be much different from vendor to vendor. As Marx once said, “From the taste of wheat it is not possible to tell who produced it, a Russian serf, a French peasant or an English capitalist.” There are many basic commodities. A few examples (that I’m stealing from Wikipedia): iron ore, crude oil, coal, salt, sugar, tea, coffee beans, soybeans, aluminum, copper, rice, wheat, gold, silver, palladium, and platinum. Some of those examples may strike you as a little odd. Gold comes in different purities, so not all gold is equal, right? And you know for a fact that there are more types of coffee than is humanly possible to count at this point. Why are those commodities? Instead of thinking of things in black and white – commodity or not commodity – think of it as a scale. On the one end, you have your goods like crude oil. On the other end is original paintings. In between are various levels of ‘commodification.’ The less differing factors between one product of the type to the next, the more of a commodity it is. For instance, laptops have a low commodity value. Due to the customizable nature of the internal hardware, such as the amount of RAM or cpu speed, there are untold variations that exist even within a single brand. When considering purchasing a laptop, there is far more to consider than the price. Moving up the commodity scale a bit we would find iPhones. These are more of a commodity for a few reasons. For one thing, there is only one brand. Within that brand there are various epochs – iPhone 3, 3g, 3gs, 4, 4s, 5, 6, etc. Then within each of those is differentiation between color, storage space, and possibly cellular network. Once you settle on one though – perhaps a Verizon-enabled black 32gb iPhone 6 – they are identical to each other. It doesn’t matter whether I buy the Verizon-enabled black 32gb iPhone 6 from Best Buy or the Apple store, I’m getting the exact same thing. Once you’ve settled on a specific model, it becomes a question of who will sell it to you cheapest. In fact, because instances across a model number have no differentiation at all, Apple has to impose price floor restrictions on them so that competition between vendors doesn’t drive the price into the dirt. The nature of commodities is such that the markets in which they are sold is a bit different than your common markets. As you move up the scale towards a greater level of commodification, the ability to differentiate your product from another becomes more and more difficult. When you reach a point that the only real difference between your product and a competitor’s product is the price, you end up in a commodity market. In a commodity market, all buyers and sellers come to the same place. It begins with an agreement of standards. A consensus is reached on the quality of each good, for example the purity of gold in a bullion. Once everyone in the market knows that everything they buy and sell will meet a certain threshold of quality, it becomes a question of price. Sellers advertise how much they’re selling their gold for and buyers can advertise how much they will pay for gold. Anyone can come to market and immediately see how much a gold bullion will cost, and how much they can immediately get for their own gold. Commodity markets typically find a price equilibrium very quickly since all data is publicly available and there’s a high volume of trades. Now we understand commodities a bit better. The more interchangeable a product is with a replacement for it, the more of a commodity it is. How does this apply to Magic cards? Anyone who is reading this is extraordinarily aware that Magic cards are not interchangeable. Prices on unique cards vary from “firewood” to “down payment on a house.” You don’t want to walk into a store and say “I’ll take one pound of Magic cards please.” Yet each named Magic card is nearly fully fungible with another of the same name. This NM non-foil M10 Lightning Bolt is the same as any other NM non-foil M10 Lightning Bolt. The names of Magic cards are sort of like model numbers. They uniquely differentiate one card from another, but cards with the same model number are identical, controlling for condition, set, and the foil characteristic. (You can think of the difference between a non-foil and a foil of the same card as the difference between a 32gb iPhone 6 and a 64gb iPhone 6.) Magic cards are unique across names, but individual instances of a specific name are nearly 100% commodities. Chances are you’ve actually seen and used a pseudo-commodity market for Magic cards, although you may not have been aware of it. TCGP acts as an aggregator for many vendors selling the same cards. Plug in Savage Knuckleblade and you’ve immediately got a large list of everyone selling their Knuckleblades, with the cheapest price listed first. If you’re a buyer, this is pretty darn close to a commodity market. What’s missing is the typical “buying” list, where you can see all the prices people will give you for your copy. That service is available here at MTGPrice of course. All the buying/selling doesn’t happen under one roof though, so it’s not really a full-fledged commodity market. The reason TCGP has been so successful in it’s market niche is because they were the first intelligent way to buy Magic cards. Why should I have to go to websites for Troll and Toad, SCG, and ABU to look at prices for the same card? They’re all selling the same damn thing. Having to visit individual retail spaces for the same product is time-consuming and inefficient as a consumer. I’m likely to not end up with the cheapest possible price on the card. Meanwhile, the vendors are not only competing on the price they can offer you the card for, but also how good they are at marketing to consumers. SCG is obviously the best at this, and the result is that they charge more money for the exact same product because they know people will come buy from them simply because theirs is the only storefront some players are aware of. Meanwhile ABU and other vendors are offering the cards for less money but are selling less copies than SCG because consumers are unaware of their options. On a whole, the Magic market was quite inefficient before TCGP popped up. It’s better now, but it still isn’t perfect. Paper Magic isn’t really likely to reach true efficiency either, at least not in the next few years. There is too much vested interest from SCG and the like to move to a true commodity market system. Magic cards want a true commodity market. While paper Magic has moved in that direction over the last few years, I doubt we’ll ever truly get there. Without a unified location for market agents to buy and sell cards, consumers will always need to visit individual storefronts. The companies behind those storefronts will always want that, because once you’re at their storefront they can attempt to sell you extra things, expose you more to their brand, attract you to their events, etc etc. In order for a market to fully embrace a commodity there really needs to be some central hub where the buying and selling occurs. That doesn’t exist in paper Magic, and is unlikely too. You know where it does exist though? Magic Online. Join me next week as we take a look at how Magic Online has failed to treat cards as a commodity and how it might look if they did. 10 paragraphs before we mention Magic cards on a site about MTG finance? Seriously? I get that you’re the “feature” writer for this site but your work is far from good. I understand that you’re explaining what a commodity is but you don’t need ten paragraphs to do it. Please improve. I knew what a commodity was, saw that he was explaining it, and skimmed down to the part relevant to my interest. Not everybody comes into this with the vast economics education that you’ve been blessed with. What if I told you that you don’t have to read things that don’t interest you? Please improve. Lol. What if I told you that you didn’t have to get your feelings hurt about someone else’s article? My point is it took 10 paragraphs of air to even mention Magic in a “Magic finance” article. I think the comment at the bottom sums it up best, “less words, more content.” Please improve. I think that your wives are probably asking you to please improve. The milk man is providing better service and he comes straight to her market. This was one of my favorite articles. I enjoy seeing real world economics applied to mtg finance, as this niche market is becoming increasingly sophisticated. It’s particularly enlightening to those younger readers who aren’t as saavy. I applaud the article and think it’s a great piece. I completely disagree. I think this was one of Travis’s best pieces. I really liked the quote from Marx. I think that the biggest problem with the overall market place is people like Ron who don’t understand what it is they are trading and selling and buying. You can’t rely on Travis to get the information on which cards to buy. What these guys can provide is an insight into the way that they look at the game/market. The most important part of making a profit, is not showing how you do it. Exactly. No one can truly predict which cards will dominate the market from week-to-week. Somedays, it feels just like day trading in the stock market (which it kinda is). Following the decks and who is playing with which cards, or which cards are selling out… It can be a full time job. Travis, thanks buddy. Good piece. I’ll agree with the above poster in that I read half the article before becoming so completely bored that I started scrolling for substance. Having found nothing but explanations of what a market was, which I would hope most of us are, I have moved on. I usually like reading all of the articles on this website, but that was a chore and I won’t be coming back for round two. I also found the intro a bit too long but I read everything. I was hoping to find a little bit of your MTGO market thoughts in this part1. As I’ve been using this MTGO market for speculations purposes for quite a while I’ll be reading part2 and I’ll be curious to see your point of you. Without anticipating on what your part2 will be or not be, and even if I tend to agree that the MTGO market is not really efficient, it’s also absolutely not the purpose of MTGO to be an efficient market place. Wotc already struggles a lot to make it an efficient game place. I’m also asking the question(s): why would you need an efficient market place on MTGO? and Who would really benefit from that? I think this piece is directed at WOTC and this will really pique their interest. Since Pike’s Market is down the street from them, they have a hard time understanding market stuff. Contrary to the above opinions, I found the article quite interesting. As a long-time collector but novice speculator, learning the economics behind MTG cards is useful to me. Thanks for the articles, Travis. I look forward to reading MTG Price’s blog every day. I fully agree with Andrew. As a speculator with few background in economics I found it extremely interesting. The 2nd part looks promising. I found this whole article very interesting, thank you. Nice work as usual. However maybe include a bit more “meat” in the first part of a two-parter next time. After all , if the first half is really good, people will come back to read the rest, but a bland first impression loses any chance of future interest. nice article, found it very educational and easier to digest because it was framed as a mtg piece. as you were discussing the ideal commodity market, the first thing I began thinking of was mtgowikiprice. I’m assuming this will be brought up in part two but if not you should check it out. I read the whole thing. I only do that if it matters.